I would like to travel in Italy for 4weeks (sept 2014). I’ve been dreaming of going to Italy for quite some time now(2008). Therefore I’m seeking info to finalize my travel tour choice and anything else that would benefit a solo independent traveler like myself thru Italy. (resources for train transport,hotels 3star and B&B’s centrally located/restaurants where locals vs.tourists eat/must see hidden gems along the path I’m traveling). *The amalfi coast/sorrento(as base location ?)vs. positano. *visit some quaint towns,experience the cuisine,music and people. Also would like to do 4 hr visit Pompeii. Naples/days 29 (Archeological museum visit) day 30 departure. 1.What’s the best tour route for this trip. 2. Is this 4 week tentative plan (local/length of stay) realistic? Again I really appreciate the time you have taken to read/reply to any part of this lengthy inquiry. This site is truly amazing. Hi Joanne, thanks for liking my blog. Coming to your itinerary, 4 weeks will give you plenty of time to really appreciate and “live” Italy. You may even be a more ambitious and include “side” (but really rewarding!) destinations such as Umbria, Sicily or Puglia in your itinerary, depending on your tastes and interests.Sicily is already partially covered in my Blog, I’m going to write about Umbria and Apulia in the next weeks, I’ve just went back there in April. Milan: yest you need to reserve your place, just call their call center at +39 0292800360 (wait for the English message). Cost is 8 € including reservation fee. Sorrento/days 20,21,22,23,24 Sorrento is a very convenient base for visiting Naples, Pompei, Capri and Positano, but I personally prefer Positano (actually, I’m in love with that small town!). Lots of days, unless you would like to have some beach days. All this area is rather expensive. Ischia /days 25,26,27,28 (also would like to do Capri day trip). Good place to relax, with many natural spas. Visit also Procida island. Again, many days, here you may cut in case you wish to visit other locations. Naples/days 29 (Archeological museum visit): foreign tourist usually skip it, but Naples is a really fascinating town (not more dangerous than New York…) The historical center is gorgeous, albeit rather ran down. I hope this long mail didn’t confuse you even more! Drop me a note in case you have other questions. hello, I am planning a vacation in two weeks for a month to Italy with my family which include 7 members. I appreciate some helpful tips as to how my time should be spent over there in Italy. Also I am interested in visiting neighboring countries, like France, Germany, Belgium, Denmark and Norway. What is the best way to do this. Hi Peter, apologies for the late reply. Are you planning to spend the 2/4 weeks only n Italy or also in the “neighboring countries”? Consider that France and Germany deserve a trip on their own, and that Norway and Denmark are actually 3 hours flight from Italy, not that near, indeed! To give you sound advice, I should also know when you plan to come, how old are your junior members and what are your main interest (culture, sightseeing, nature, …). Without these elements, and assuming you are travelling with kids, I would suggest to have a look at my “2 weeks itinerary” and to extend it to 3 weeks, so to travel at a more relaxed pace. Hi jean Pierre, my wife and 2 boys, aged 5 and 3 would like o spend a month in Italy September/October 2016. We will be based in Croatia prior to the trip and have always wanted to visit Italy. Would you be able o recommend an itinerary? must see locations are Tuscany, Venice, florence and the Almafi Coast but really we have a month so are happy to explore. 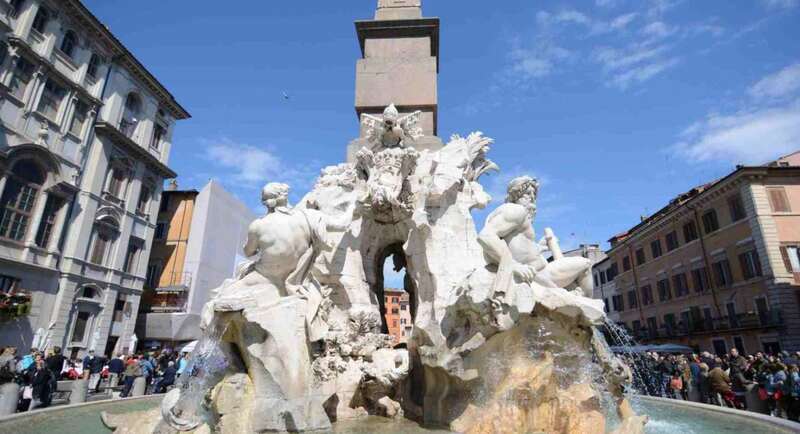 Hi Adam, have a look at my new page: http://delightfullyitaly.com/italy-in-four-weeks-or-more/, and cherry pick your favorite destinations. With such small childs I would avoid too much travelling, so you may want to choose 3-4 hubs and explore from there. Have also a look at my “Venice for kids” post. Hi Jean, i’m a filipino residing and working in UAE im planning to visit my friend in rome, italy and stay there for 1 month, will it be hard for me to get the schengen visa? do i need a show money? how much approximately? Yes, you need to show that you have a return ticket, an accomodation. a medical insurance and a bank guarantee (I don’t know the value). I suggest you get more information at the Italian consulate in the UAE. We need to plan everything from where to start to finish. Your help to make this trip would be appreciated. Hi Tim, I’ll be more than glad to help you shape your bucket list itinerary. Could you share some more info about the period you are planning your trip, what you like to do (culture? food? Nature?). Would you like to visit all the destinations mentioned in my post or just a selection? Hi Jean-Pierre my name is Samah I have a month maybe more. I need your help to plan my itinerary in Italy which I prefer it includes cooking classes. At least 4 days in one base place to reach others in day trips. I have 2 babies 2/1. Hello Jean-Pierre! I love all your invaluable suggestions and advice. My husband and I will be celebrating our 25th wedding anniversary and are planning a 3 week vacation in Italy…Arriving September 2nd and departing September 23. He has already been to Verona and Bologna – cycling in Grand Fondo. Nothing is set in stone yet however, this is what we are thinking: Landing in Milan. Bellagio (2 nights) Venice (3 nights) Florence (4 nights) Santa Margherita Ligure OR Porto Venere – CAN’T DECIDE! I want to see Portofino and Cinque Terre (3 nights), visiting family in Campobasso, Molise (1 night), Sorrento (4 nights) and back to Rome (4 nights). I’d appreciate your constructive criticism. Hi Teresa, thanks for liking my blog! Your itinerary makes perfect sense and I think you are dedicating the right amount of time to your stops. If you want to visit Portofino AND Cinque Terre, Santa Margherita makes more sense, and is easier to reach by train. An alternative, cheaper, beautiful and conveniently located could be Sestri Levante. On your way from Florence to CT, consider stopping in Lucca and / or Pisa, it’s on you way. Sorrento is nice, but if you want to really experience the amalfi coast Positano, Amalfi or the smaller hamlets like Praiano can be a really good alternative. Hello We are planning a 28 day trip to Italy for 2. We will start and finish in Rome. Want to head north first,Venice Tuscany Lake Como Milan.Any ideas on how do do this and where to go? Also want to go to Southern Italy and Sicily and finish up in Rome.Any help would be greatly appreciated would not mind renting a car for a time and also taking trains. Thank You for any help you can provide. Jeff Peretz We will arrive on April 27. Hi Jeffrey, have a look at my post “//delightfullyitaly.com/italy-in-four-weeks/”, this should give you some ideas. From a logistic point of view, in Northern Italy (down to Rome) high speed trains are the most convenient option – however you may consider renting a car in Florence to visit Tuscany in full freedom. From Rome many low costs flights to Sicily (I would land in Palermo and leave from Catania). You’ll need to rent a car there. Sicily is a dream in April! Me and my boyfriend are going to Italy for 4 months for study abroad. We will be there from the end of August to the end of December. I was wondering if you could give us some suggestions for cities/towns that are good for weekend trips. Well, quite a lot actually! Where will you be based? What does thrill you?